Chant & Bhakti Yoga in India & a Simple Morning Practice for Calmer Days. One morning while staying at the Divine Life Society Sivananda Yoga Ashram in Rishikesh, India, I awoke at 4:30 a.m. to the chant Mahashakti Mahashakti Om Om Om Om Mahadeva repeated over and over from a temple across the Ganges River. The mantra reverberated not only throughout the ashram but through my conscious, subconscious and what felt like every cell in my body. 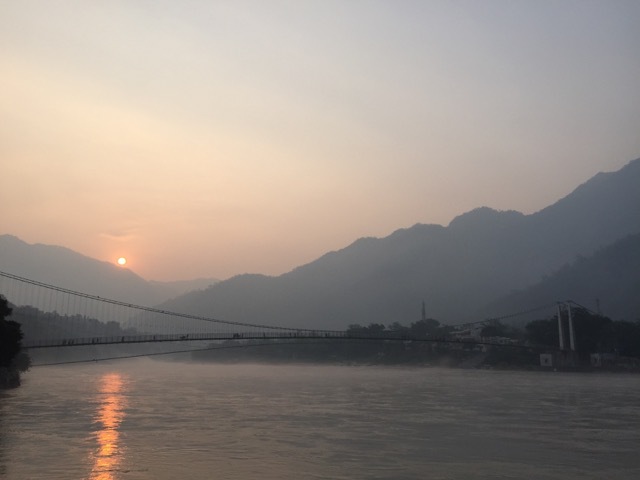 The day that I heard chants in Rishikesh was not unique or a specific holiday in India, but they are some of the sounds you hear daily, in a country filled with devotion and ancient traditions of pure love and connection to the source of life, the sun, the rivers, the animals and all that exists. The thought waves in the mind may be the most quiet, according to the yogis, at the amrit vela, which is Sanskrit for the auspicious or ambrosial hours before sunrise (4:00 to 6:00 a.m.) when most others around you are asleep. At that time, the sky transitions from dark to light and often the only sounds you can hear are the birds chirping, easing gently into the sounds of the day. Waking up this way to devotional chants, or kirtan, as it is called in Sanskrit, puts your mind, conscious and subconscious into a state of remembrance to our connection with all that is, to the Source of life, and puts the mind and heart into a space of bhakti (sanskrit for devotion and love). In Rishikesh just a few minute walk along the Ganges River, I saw a large gathering of women doing sacred mantras inside a temple, an Arati fire ceremony offering and honoring light in the sunset hours, a large group of people dancing on the banks of the Ganges in pure joy and ecstasy, and a small temple with a only a few people chanting to lift the spirits of an entire city. Also that month, while at the Golden Temple in Amritsar, India I heard the continuous chants from the Sikh traditions, both soothing to the soul and rhythmic to the ear. Music is universal and brings joy and peace to all in various forms. These kirtans or repetitive call and response chanting (often with tabla or other Indian instruments) however, are slightly different as the names of the divine can affect every cell of your being to a source that is pure love, creativity, peace or that which you are focusing on and calling to with the mantras, chanted for thousands of years, carrying with it a message to the conscious and subconscious mind. While some of the world starts their day with news, internet, coffee and television, the natural start of the day for a yogi is to be in tune with the rhythms of nature, to awaken and honor the sun as it rises and to recognize that each day is a gift and a chance to be in a place of gratitude and praise for that which gives us our breath and vital life-force (prana in sanskrit). As we awake in the morning (or transition to sleep at night) we can change the perspective of the entire day by pausing to tune into the core of our being and be in remembrance, regardless of the external circumstance and events that will or have occurred. India is so rich in devotion; from locals rising before the sun to bathe in the Ganges and recite sacred chants, to the yogis performing hatha yoga postures such as the sun salute to honor that which gives our planet life and light (Surya Namaskar in Sanskrit). As I meditated on the banks of the Ganges, where the yogis of ancient and current times do, after rising to the chants across the Ganges, I felt a deep peace within as the mantras that were chanted the half hour prior still seemed to resonate over the entire Ganges River, permeating the air with divine quality of pure peace, joy and Spirit, recognizing the Source of life, that which gives us each breath. The power of the ancient yoga mantras and chants, and the people of India who carry on this tradition in modern times with pure love and devotion is a true gift and blessing to the world that can be replicated in all parts of the world. The idea to sit in silence, and observe the breath, the source of life, as the yoga sutras of Patanjali called dharana in Sanskrit (concentration) which leads the practitioner to a state of dhyana (meditation) is a well needed gift for modern times, to humanity everywhere. It is utterly peaceful and breathtaking to stand by the Ganges River at sunrise and sunset and see the locals honoring the waters and sun and rhythms of the day. You don’t need to go to India, to a temple or even leave your own house or own bed to get a taste of what this Bhakti Yoga offers. Perhaps before jumping out of bed and going to the coffee maker, computer or TV you can pause, and be aware that you are breathing, and take a slow deep breath with gratitude that you awoke another day. Although they say the Sanskrit and Gurmukhi mantras from India (the word mantra literally means projection of the mind in Sanskrit) carry a sacred force or vibration as spoken from the gurus, and rishis or ancient seers, there is always a benefit to repeating a positive word to your self, even as simple as repeating the word peace (shanti in Sanskrit) silently. Regardless of which language, there is a benefit to focus on uplifting or peaceful reminders of the divinity within. Even a simple breath or sound reception to slow down and calm the thoughts in the mind, the endocrine and even the nervous system is a way to keep the mind at peace and centered, and not run by the thoughts that constantly come and go. The benefit is to sit with yourself, get to understand and view your own mind, feel yourself in the present moment, aware of the body and tuning into your own inner peace and devotion to your own Source, whatever that means to you. As Swami Sivananda said, “Meditation is the invocation of the divinity living deep within.” Whether through chanting or a silent meditation, may we all become aware of the divinity that is always within us. 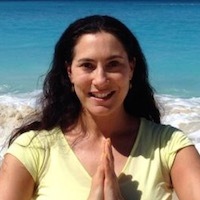 Stacie Dooreck is the author of SunLight Chair Yoga: Yoga for Everyone! books and offers Chair Yoga teacher training online and at the Sivananda Yoga Bahamas ashram. Stacie is currently a Stress Management Specialist for the Ornish Heart Disease Reversal Program in N. CA and teaches at Bay Area companies. Stacie is a Certified Sivananda Yoga Instructor (1995), Gentle Integral, and Kundalini Yoga certified instructor, based in Bay Area, California. Visit her website.